Dubbed the "big" Mini, the 2015 Mini Cooper Countryman is the burliest vehicle in the brand's lineup. Its 5-passenger interior and expanded cargo bay add practical value, while its available all-wheel drive makes this Mini better suited for winter driving. There's no denying the Countryman's retro-cool attitude, but fresher rivals have arrived in the Mazda CX-3 and Fiat 500X. 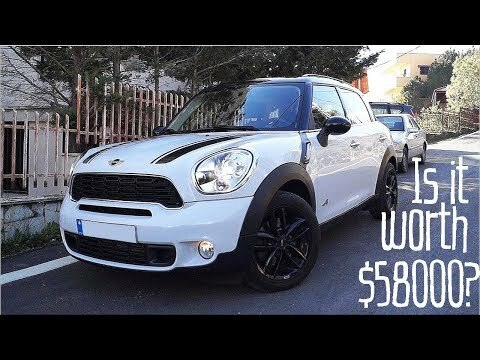 Pros and cons of the mini cooper countryman�s base engine. The engine is not fast enough for me, however because the engine is small the gas mileage is pretty good. I fill up my tank with 25 dollars and lasts me for good 6 days of commuting from one side of town to the opposite side. I love and hate the leather seats. They look great but they are very uncomfortable in the winter and hot summers. It is a small car so I can fit in anywhere but I can still fit in 5 people in my car. My car performs great it all weather. Handles great, had amazing pickup, and is spacious enough for what I require. I have a rack system that allows for hauling kayaks and is really fun to drive. Being a 4 door it allows for plenty of room for 4 people comfortably. The trunk space is a little small, but not horrible. A little planning ahead and you can fit all you need into this sporty and fun car. Great car-would buy all over again. Within the first year of ownership I had to get four new tires and the wires that connect the engine to the starter (or something like that, I cannot remember what they are called. ) But other than that, I really love it, gas mileage is not bad, the size is kind of perfect, I would feel safe having kids in car seats in it.